US demand for pet food packaging will rise 4.8 percent annually to $2.5 billion in 2018. Pouches will be the fastest growing packaging type based on their consumer convenience features and light weight. For small packages of dry food, pouches will continue to supplant bags. Chilled and frozen pet food will be the fastest growing application. 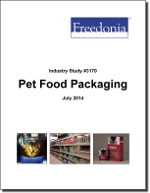 This study analyzes the $2 billion US pet food packaging industry. It presents historical demand data for 2003, 2008 and 2013, and forecasts for 2018 and 2023 by application (e.g., dry food, wet food, pet treats, chilled and frozen), animal (e.g., dog food, cat food), type (e.g., bags, metal cans, pouches, folding cartons, plastic bottles and jars, tubs and cups) and material (paperboard, plastic, metal, wovens). The study also considers market environment factors, details industry structure, evaluates company market share and profiles 32 industry competitors, including Silgan, Coveris and Ball.